Your card is lovely. Very classy & elegant. 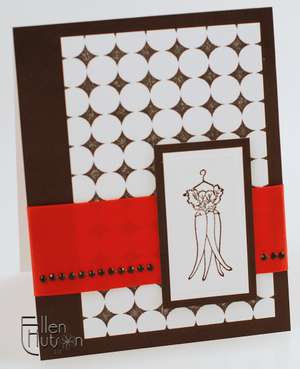 Hi Ellen and welcome to The Daring Cardmakers - thank you for your kind words on our blog. I absolutely love your card - its just so CLEVER! I think the ribbon looks great on here. Unfortunately, I don't think that width of ribbon is something I would use much, if any. Gorgeous! Now I have to get this background stamp too. They look so amazing when shown what to do with them. TFS. Oh Ellen this is absolutely hot. Awesome card. Gorgeous design. Love it. Love this card - I'm hoping to participate in the backgrounder blitz later on today . . . you've inspired me. As for the wide ribbon - I love how it looks on your card. I actually thought that it was a red vellum panel. Would I buy it for my cards? Probably not, only because I LOVE to tie knots and bows on my cards, and I fear that this ribbon would be too wide for that. 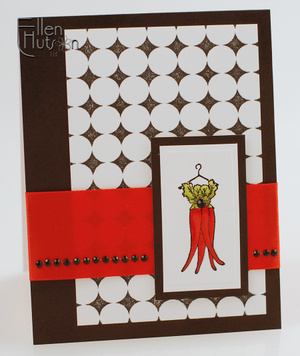 fantastic card-it would be perfect for the daring cardmakers challenge this week! This card does it for me. I love black and white anyway and the ribbon and the coloring of the image is just great and of course the "bling" gives it just the right amount of "spice". I have always like white with a color or black & white with a color. A lot of my inspiration comes from magazine ads, not that I read a lot of magazines (who has time for that?) but I notice the colors and placements when I do! You are so creative Ellen. I had lost 60 pounds over the course of 3 years on Weight Watchers, but a year and a half ago, I had an auto accident and had to quit exercising because of back pain. Well, about 40 of those pounds are back on--I am heading for Florida for back surgery this coming Thurs. and after my 6 week recovery, I will be back on track. I am very nervous but am certain I will be better. Love your card. Thanks for putting some spice in my day. What a wonderful card! The backgrounder is perfect for this look! My inspiration comes from many places but I absolutely love the illustrations from children's books to get my creativity going! 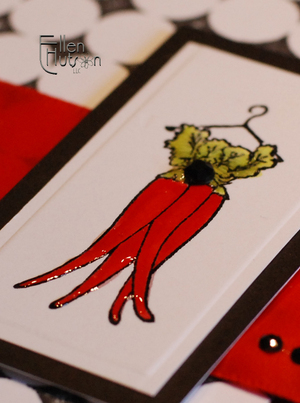 Love the boldness and brightness of this card!